Lois Dean, a volunteer from Bolton, has researched and written this account of peacetime celebrations from Bolton’s collection. 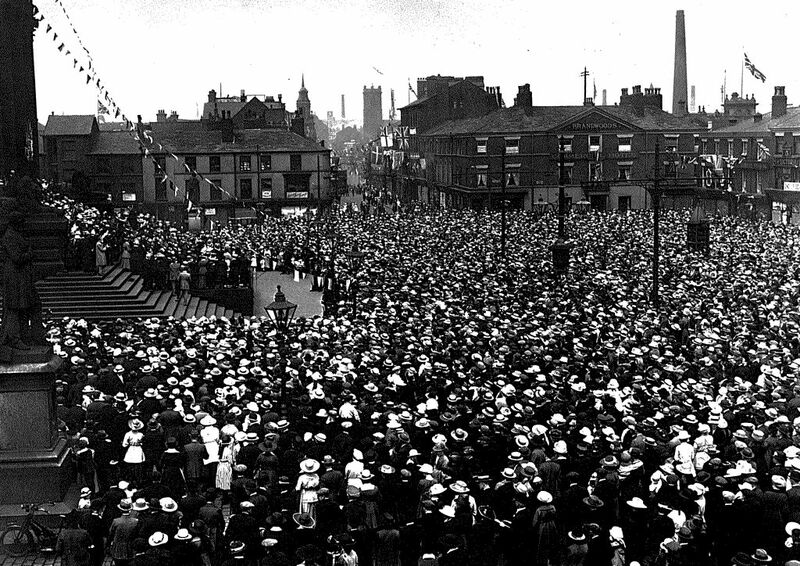 The summer of 1919 saw peace celebrations taking place throughout Britain and the Bolton area was no exception. However, the Sunday appointed by King George V as a Day of Thanksgiving for Victory and Peace was July 6th, which coincided with the end of Bolton Holidays. A special form of thanksgiving and prayer had been issued nationally (there is a copy in Bolton History Centre) and all local churches used this, even though the holidays meant there were fewer parishioners than usual present. Many more local people took to the streets later in the month on Saturday, 19th, when Bolton folk turned out for the Peace Celebration. The festivities began at 10.30am, when the church bells rang out for a full half-hour. At 1 o’clock, the Town Hall steps in Victoria Square were the venue for a rendition of the ‘Hallelujah Chorus’ by massed choirs, accompanied by Bolton Subscription Band. Thanksgiving prayers were said and hymns sung by the crowd of townsfolk assembled in the square. Later in the afternoon, it was the turn of the schoolchildren, who, having gathered at their respective schools, marched in procession to a local recreation ground, carrying banners and waving flags. Once there, all the schools took part in a drill display and then sang a special thanksgiving hymn, followed by ‘Land of Hope and Glory’ and ‘God Save the King’. Four o’clock saw the elderly of the town, as well as deaf and dumb and blind people, enjoying a tea-time treat in local schools and the day concluded at 10pm with a firework display at the recreation ground. Throughout the day, Bolton Subscription Band, Bolton Military Band and Halliwell Band played at various venues throughout the town. 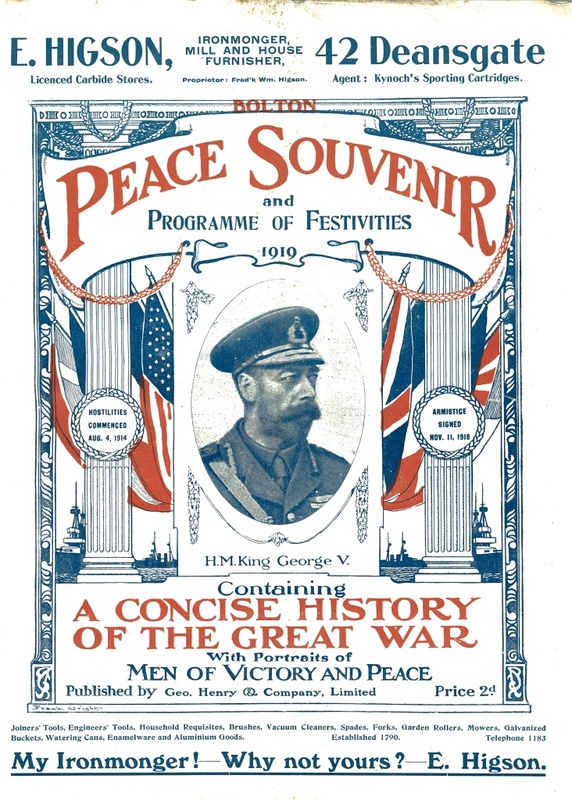 A Peace Souvenir and Programme of Festivities was produced. It has a portrait of King George V on the cover and inside short biographies of leading politicians and military commanders and a list of significant events during the conflict. Bolton History Centre holds a copy. The following month, on August 7th, children throughout the town enjoyed a special treat at their schools. Field races, other games and sing-alongs were organised and all manner of tasty food was on offer, much of which had been scarce during the war years. Nearby Farnworth held its own peace celebration on Saturday, August 2nd, when children from all the local Sunday and day schools marched in procession to the town’s market ground for a special thanksgiving festival. The schools were accompanied by ten brass bands from Farnworth and surrounding districts. A souvenir programme was produced by Farnworth Urban District Council and a copy is held at Bolton History Centre. 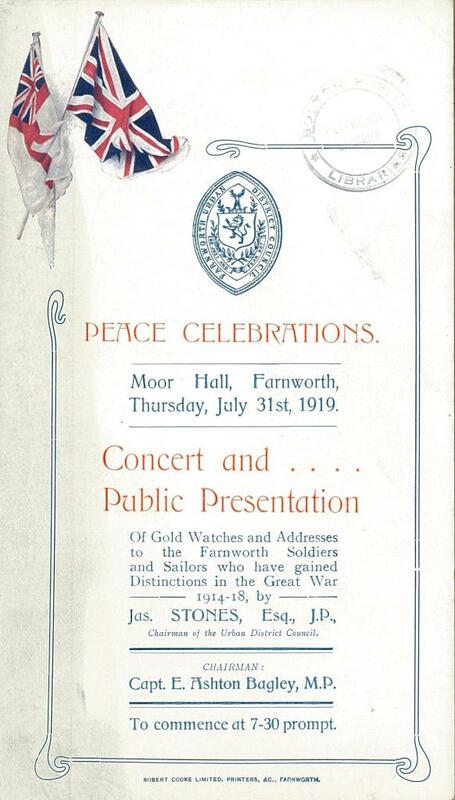 Farnworth Peace celebrations: concert and public presentation B940.3.FAR. Bolton History Centre.